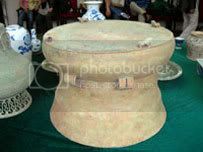 A Dong Son drum is one of the prized artefacts up for auction this weekend at a Vietnamese antique collectors’ festival in Hanoi. So how much would a Dong Son Drum set you back? The precious relics to be auctioned include the Dong Son Bronze Drum, worth VND120 million (US$7,500) at starting price, and the Dong Son Tower.